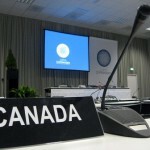 The United Nations and Canada – Can We Do Better? Presented by the Graduate School of Public and International Affairs (GSPIA), CIPS and the World Federalist Movement – Canada (WFCM). Free. In English and in French. Registration is required. Please RSVP to [email protected] by November 28th (you will not receive a confirmation). Seating is limited. The United Nations is the responsibility of its member states. When members cannot or will not agree, the UN is stymied; and when members do not provide the means to act, the United Nations cannot act effectively. Change, improvement and reform have been a constant since the UN was founded. It is the responsibility of all member states, including Canada, to actively and constructively engage. PANELISTS: Louise Frechette, Former UN Deputy Secretary General and Senior Fellow, GSPIA, Ferry de Kerckhove, former Ambassador to Egypt and Senior Fellow, GSPIA, Ian Smillie, Author of The Charity of Nations and Diamonds and Chair of the Diamond Development Initiative, Alex Neve, Secretary General Amnesty International Canada. Chair: Prof Alexandra Gheciu, GSPIA. Introduction by Fergus Watt, Executive Director, World Federalist Movement – Canada.